The whole family will enjoy staying at Streamside’s secluded village of 21 cabins and suites sprinkled over 29 acres of pine and aspen trees in Estes Park, Colorado. Fish for rainbow trout right outside your cabin or enjoy a gentle stroll around the property shared with elk, mule deer, and an abundance of other wildlife. Challenge yourself to the summit of Old Man Mountain for breathtaking panoramic views of the Estes valley or head into Rocky Mountain National Park for amazing wilderness experiences. Located on Fall River, just one mile west of the shops, art galleries and restaurants of downtown Estes Park and just three miles from the Fall River entrance to Rocky Mountain National Park, Streamside is the perfect location for a fun Estes Park getaway! Cabins and suites feature gas fireplaces, private hot tubs, jetted tubs, fully equipped kitchens, free Wi-Fi, cable TV & DVD players, gas grills, and private decks. Guests have access to an outdoor hot tub for a relaxing soak after a fun filled day. You can even enjoy a relaxing massage right in the comfort of your suite. The kids will enjoy our spacious lawns and horseshoe pit. We offer complimentary books, board games, and an extensive DVD library. Streamside is open year round! Summer is our most popular season with horseback riding, hiking, whitewater rafting on the Poudre River, or enjoying ice cream in downtown Estes. But each season here is special… Fall brings the yellow aspen leaves and the elk rut. Winter means cool, crisp days enjoying festivals and cross country skiing, fireplaces and hot tubs. Spring starts snowy, followed by the re-awakening of the local vegetation and wildlife. 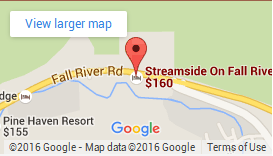 Enjoy everything the Rocky Mountains have to offer at Streamside on Fall River.